When you do not have any choice, the best survival knife there is, is the one you have with you. When you do have a choice however, you should choose a knife best suited for the situation. Not all knives are created equal and some are designed for specific tasks such as butchering and skinning wild game. This is not to say however that a skinning knife cannot be used as a survival knife and a survival knife cannot be used as a skinning knife. Know the difference though so you can make an informed decision. A survival knife should be a multi-tool, capable of performing multiple tasks. If you left home with nothing but a good survival knife, you have increased your chances of survival dramatically. Survival is defined as “to remain living” and in some cases, it can be a desperate attempt to remain living. To sustain life you need shelter, water, fire and food. 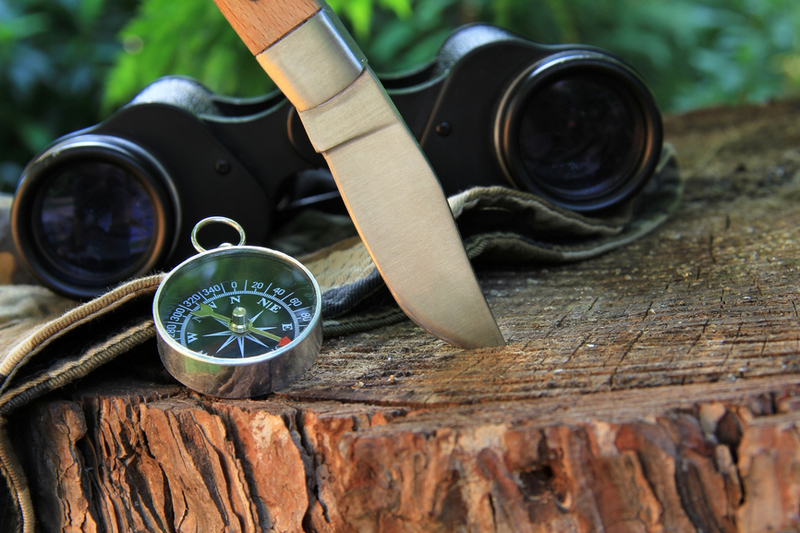 A good survival knife can help you obtain life’s essentials in a survival situation. Fixed bladed means it does not fold. 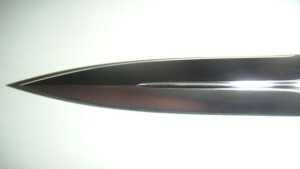 Fixed blades are typically carried in a sheath that is included with the purchase of the knife in most cases. 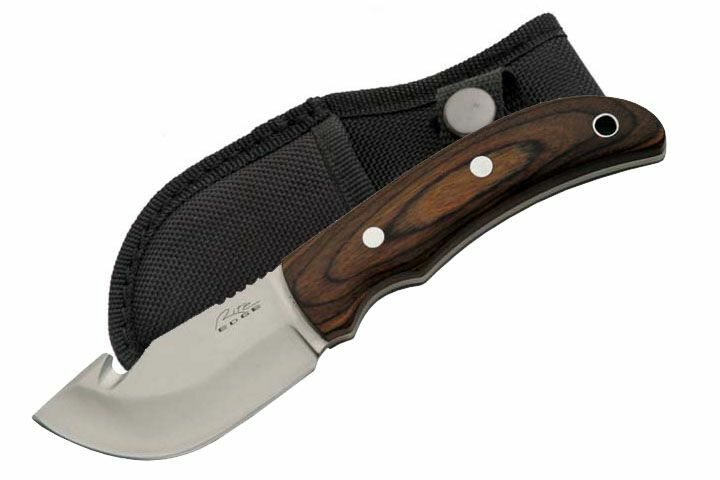 The knife pictured below includes a hard plastic sheath. Some people prefer a hard sheath because it is easier to draw the knife one handed. Leather or nylon/canvas sheaths make it difficult to pull the knife without holding the sheath with one hand. This means both hands are needed to draw the knife. You can however use a leg tie down to hold the sheath tight to the thigh, which can help you pull the knife one handed. Being able to pull a knife one handed is important. You may have injured a hand or in extreme circumstances are holding back an aggressor or wild animal with one hand, so you need to be able to grasp and pull your knife with your free hand. The disadvantages to a hard plastic sheath is the noise it makes when pulling the blade or reinserting the blade. In a tactical situation, you may be practicing noise discipline and plastic will create noises when scraped against the hard steel of a knife blade. A preferred sheath material for those that want a customized sheath is KYDEX®, which is a line of thermoplastic acrylic-polyvinyl chloride materials, hard moldable plastic in other words. The plastic can be easily molded to fit any type knife blade by heating the material and then molding around the blade. Once hardened again it holds the molded shape and it is virtually indestructible. In some cases, while the quality of the knife itself is superior the manufacturers sometimes fall short when it comes to sheath quality. The blade pictured in Fig 1 is 3.4″ with an overall length of 7.8″ with a molded rubber handle and the blade is full tang, which means the blade and handle are one piece with the handle being approximately the same dimensions as the blade. The pictured knife has a pommel that can be used for hammering or breaking glass and has a lanyard hole for attaching a “dummy cord”. There are full tangs, partial tangs, and then there are knives where the handle material is attached to an inch or less of the tang (because that is all the tang there is) using rivets or even epoxy in some cases. 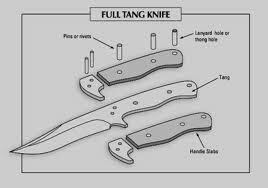 There is no reason to purchase anything other than a full tang survival knife. With a full tang if the handle breaks you can still use the knife by wrapping in Paracord or duct tape. A partial tang knife once the handle is broken is not very useful. 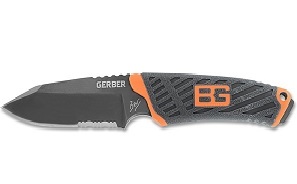 While the Gerber knife is ideal for most circumstances, experts would consider this a backup knife or a so-called utility knife but an all around good camp knife nonetheless. It is probably not big enough or has a heavy enough blade for splitting large pieces of wood. To split wood you would place the blade against the wood piece and strike the backside of the blade with a stout stick/wooden baton, rocks and other metal would damage the blade. The blade has to be heavy enough to be driven through the wood. You can chop large limbs into smaller ones using this method as well. The overall length is about the maximum anyone would want in a fixed bladed survival knife. Any longer than 12 inches overall and it, gets awkward using the knife for smaller tasks like cleaning fish, gear mending and carving small pieces of wood. The modified spear point blade means it is ideal for plunge cuts, and this is particularly important in a self-defense situation against an aggressor or wild animal. The notch between the blade and handle on the blade side can be used along with a Ferro rod for fire making. The knife is full tang with a lanyard hole and striker at the pommel. The Fällkniven is heavy enough to perform any survival task such as chopping through vines, limbs and splitting wood. Because of the VG-10 blade material, once sharpened it holds an edge well but can be easily honed sharp using a whetstone, diamond stone or even the file blade on your multi-tool. When it comes right, down to it, any sharp bladed knife can be a skinning knife but not all skinning knives are ideal for some survival tasks. The above-pictured knife is a traditional skinning knife. Skinning knives are designed in such a way that the hunter can easily remove the hide with less chance of puncturing the intestinal track of large or small game. The gut hook on the backside is used to slit the hide opening up the animals’ cavity without rupturing the stomach/intestines. However, as stated earlier, any knife you have in a survival situation can be a lifesaver. Instead of carrying, multiple knives find that one knife that can do multiple tasks. There is nothing wrong with having back up knives and it is encouraged but any knife you carry should be able to step up if one of your other knives is lost or damaged and do any task needed in a survival situation. Blade Length is 4.0 in. Length open is 9.3 in. Length closed is 5.5 in. Any folding knife you have should be such that it can be opened one handed as stated earlier you can have an injured hand or your other hand can be otherwise occupied. You also need to be able to close the blade safely with one hand as well, so it is important that it have a “liner locking” mechanism. Note the metal bar that holds the blade locked, this metal bar (leaf spring or lock bar) can be depressed with the thumb holding the knife so it can be folded closed with one hand (the hand holding the knife). Close the blade using your fingers as the thumb pushes against the metal liner lock. You should carry a good quality-folding knife with you at all times. Grabbing your folding knife should be a habit just like grabbing your car keys, wallet, purse or even briefcase before you set out for the day. You do not have to be stranded or lost in the wilderness to be in a survival situation and a good knife whether folding or not can mean the difference between surviving and not. The looks of a blade can be everything to the uninformed knife buyer, and manufactures know this. There are the so-called Rambo Knives™ that look vicious and intimidating. The heavy saw tooth back side and the wickedly curved point convinces some this is enough to ensure their survival in any situation, not to mention the hollow knife handle loaded with survival supplies. This is how the knife is marketed, but it is recommended you leave it home or better yet save some money and leave, it in the retailers’ display case. Notches cut into the spine of a blade (choil) are created to provide a grip for your thumb or forefinger beyond the bolster. This is called jimping. The notches on the pictured knife while, looking rugged and intimidating serve no actual purpose however. The jimping on a survival knife is just a few notches near the handle on the choil to provide a grip for your thumb or forefinger for control of the blade when doing delicate work with the blade. Rarely will any knife that has a saw tooth back actually serve as a wood, rope or nylon strap-cutting tool. The notches can however be used to lift hot pots from a fire by hooking the handle on the jimping to prevent the handle from sliding up the blade and scalding you. The exaggerated saw tooth designed blade is just for looks and the deeps notches can weaken the blade in some cases. The wire-cutting slot is not a bad idea except for the fact the knife is not a full tang because the handle is hollow, and if you attempt to twist heavy gauge wire using the wire-cutter you are likely to snap the blade off at the handle. To cut or break wire with built-in wire cutters the notch in the blade twists the heavy wire back and forth to weaken it and eventually break it. The type of blade you choose other than the example above is in many cases a personal preference and looks may have something to do with it. However to make a decision you need to know why a knife blade is designed the way it is so you can choose the one best suited for your needs. The drop point blade is considered by many to be the most versatile and thus useful survival knife blade. The drop point tip is designed for strength, so you can plunge the blade into hard objects such as ice or wood with less chance of breaking the tip. The blade can be used for skinning, butchering and cleaning fish and used as an eating utensil. You may very well have to cut your way through several inches of ice to reach water or to fish so having a strong point is important. The blade is ideal for splitting/chopping wood by striking the backside with a stout piece of wood. As far as being a survival knife, a spear point blade is really only good when lashed to a stout sapling and used as a spear for fishing, hunting and self-defense. A spear point would not be considered an overall good camp/survival knife blade. The double-edged blade is dangerous if you have to carve wood, mend gear or do other small tasks where you need control of the blade using a thumb or forefinger over what would be the non-sharpened choil of single edged blade. The point can be easily broken off if you plunge cut or pry with it. It would not suitable for cleaning fish, skinning or butchering wild game. A spear point blade only has a few uses in a survival situation and virtually any other type of knife blade could be used instead. It is not recommended for other than self-defense in an emergency and then you still run the risk of cutting yourself because of the double-edged blade. The word “tanto” is actually an adaptation of the Japanese word tantō, meaning chisel point that only refers to the straightness of the blade’s edge and not the blade edge itself. Some believe the tanto blade as is known today is similar to the Japanese swords called kamasu kissaki or “barracuda tip” swords. 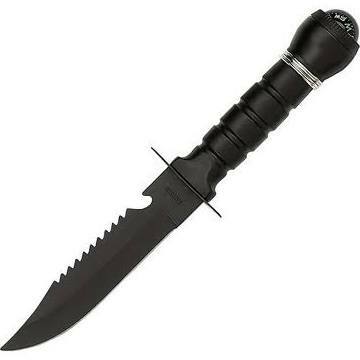 The tanto blade is considered a fighting blade but nonetheless is well suited as a survival knife. Because of the so-called chisel point, it can be used for prying and as a chisel to shape wood. The straight edge at the tip is idea for pushing along a piece of wood to make wood curls for tinder. You have control of the blade because of the angles of cut. You can use the tanto blade for skinning because you do have better control of the cutting edges so this can help prevent going to deep when opening up the animal’s cavity. Tilt the knife blade forward and use just the chisel tip for opening up cavities. The blade is ideal for plunge cuts into ice or wood and of course is designed for stabbing in a self-defense situation with a wild animal or human aggressor. Clip point blades have the backside at the point “clipped” hence the name. In most cases, the back edge of the point is not sharpened by the manufacturer and is called a false edge. Owners of such knives however have been known to sharpen the back edge to increase the knife’s effectiveness in piercing. The knife pictured in Fig 12 is a Bowie Knife designed by mountain man/frontiersman/politician Jim Bowie. In years past mountain men used single shot muzzleloaders and if that one shot was not enough to bring down a charging bear a knife was needed to finish the job. A person needed a large sharp knife that could plunge deep into the tough hide of a bear, mountain lion or human aggressor. 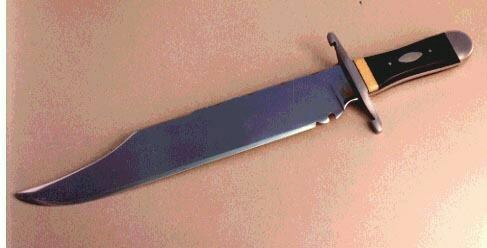 The Bowie was mainly designed for self-defense but adaptations of the knife have been called survival knives. One reason many consider them a survival knife is their large size and heavy blade. Typically, this type of knife is not suited for smaller tasks such as carving or cutting material for mending gear. The Bowie type knife is not suited for chopping because there is less weight at the front end. The heaviest part of the blade is near the handle making it awkward for chopping. Fig 13 is a clip point but not as dramatic a clip point as on the Bowie above and the cutting edge of the second pictured knife is designed for chopping because of the rounded end near the point. This knife would not be called a Bowie but has a clip point nonetheless. For some people the clip pointed blade represents a “true knife” blade and once again manufactures and marketers of survival knives know this. Obviously, the clipped blade is prone to snapping if stress is placed on the tip and would not be ideal for hacking through ice or digging up edible roots. However, a large bladed heavy knife is useful but once again, because of the blade design it is not as useful for some tasks as would be other knives. Before you can decide on a knife blade, you need to have an understanding of what rigors the knife will go though. Looks are not everything when it comes to blade designs. Practicality is however, and if you find you are buying a knife for just one purpose look for that one knife blade that can do it all. There are tasks that have to be completed if you find yourself in a survival situation and you need a blade that can literally do any you are confronted with. In choosing material for a survival knife blade, there is what is considered by many an acceptable range of hardness starting at 52-56 HRC, which would be considered low range hardness, 56-60 HRC would be medium and above 60HRC is considered hard. The hardness scale determines how well a material stands up to abrasions and impact (can the material be easily dented/scratched by impact). Lower numbers on the HRC scale indicates softer material while higher is harder. This is a simplified explanation of hardness because many times when advertising a knife blade material manufactures will advertise HRC figures that some people simply cannot understand. It is Hardness on the Rockwell Scale C. “C” is the scale used for knife blade material. Knowing how hard the material is from a technical standpoint, may not be as important as knowing how well it holds up under particular circumstances. Glass is very hard but shatters easily, and it would be impossible to sharpen a piece of glass without specialized equipment. You want a blade material that offers hardness when it counts and a softer more pliable material when it counts as well. Where hardness is important is the retention of a sharpened edge. You do not want a blade that dulls chopping wood and yet you do not want the blade so hard it chips if you accidentally strike a rock or other hard material. Having to hard of a blade means hours of honing and filing to put an edge back on and to remove the chips. Most carbon steel blades are harder than stainless steel and do require more effort to put an edge back on. In most cases, carbon blades require a diamond stone or diamond honing steel. Too hard and the blade, edge or tip snaps under pressure but too soft and it may bend out of shape somewhat. If the material is too soft, the blade dulls easily. However, this means it is easier to put the edge back out in the field using a coarse rock, file, sandpaper, diamond stone or whetstone. You will see the words carbon and stainless when shopping for knives. You will see numbers for carbon steels that run from 1045 to 1095 when searching for carbon this is called the 10xx series. The 1045 thru 1095 series is the most common grades of carbon steel used for knife blades. The different numbers indicate the carbon content for example, 1045 has .45% while 1095 has .95%. Note the last two digit indicate the carbon content (1045 =.45% and 1095 =.95%) The higher the carbon content the greater edge durability you will have but conversely the harder the knife is to sharpen. Quality skinning knives are typically carbon steel because of the edge retention and hardness of the blade. Butchering and skinning game is harder on a knife than most people that have never field-dressed wild game would expect. Carbon at one time was the only material used for knife blades and lower quality carbon steel was difficult to maintain and would rust/pit quickly weakening the blade considerably. Carbon steel is simply carbon and iron with manganese. Because it is carbon, it will corrode and rust if not properly taken care of. Many knife manufactures are now promoting a corrosion coating on their blades to help combat rust and corrosion but like any coating it will wear off so do not assume any carbon knife is protected unless you have done it yourself. Clean the blade after each use and wipe quality blade oil on it to prevent rusting. Stainless steel is a steel alloy with a minimum of 10.5% chromium; otherwise, it cannot be called stainless steel. Chromium is what gives the steel its corrosion resistance, but it is just resistance because stainless will corrode over time and the environment the knife is used and stored in makes a difference. Saltwater for example would destroy a carbon blade while, stainless can hold up well, but over time depending on the chromium content stainless would also corrode. The technical explanation of why stainless is called stainless is that stainless steel contains a sufficient amount of chromium (must be at least 10.5%) that forms an inactive or passive film of chromium oxide that prevents surface corrosion by blocking oxygen diffusion. Stainless steel is less hard than carbon but the trade off is corrosion resistance and durability. While stainless will not hold an edge as well it is quite easy to put an edge back on a stainless blade. Stainless steel grades for knife blades typically start at 400 and run thru 425 and the higher the number the higher grade of steel. Then you have 8Cr14MoV and AUS-8 and then there is 9Cr13CoMoV Steel, which is simply 440 stainless steel with extra cobalt, mixed in to strengthen the blade. It has about an .85% carbon content. The Aus-8 is Japanese steel and the other two are typically made in China. You would never be able to look at a knife blade and tell what material it was made of. All you would know is that either that knife does what you need it to do with a little care and an occasional honing throughout the day or it fails on all counts. However, any one of the grades of steel described would make an excellent knife blade. If you expect to be working in a marine environment where there is saltwater you want to pay attention to the quality of stainless steel, the higher the chromium the greater corrosion resistance. If you are a hunter then you want to look at a quality carbon blade such as a 1095, and then have a quality stainless blade for other survival tasks where getting the blade wet or covered in dirt will not ruin the blade if not cleaned off right away. Choosing a survival knife is all about durability, edge retention, blade and handle design and your personal preferences. You can of course buy the cheapest and then be let down, because there are cheap knives manufactured with metals that cannot be identified. Stick with name brands, read the specifications carefully, and then decide what you want your knife to do and in what environment you want it to perform in and then simply choose one based on the information provided. This is the most expensive of the 3 survival knives reviewed but it is worth every penny and then some. The Fallkniven Company manufactures their own blades and they pay close attention to their customer feedback on their performance which has seen the Fallkniven brand touted by those in the know as the benchmark in perfect survival knife design and durability. Measuring just over 11 inches in full length, 10 to 12 inches being the ideal length for survival knives, the Fallkniven A1 features a full length tang which always makes for a stronger blade. The exposed blade is 6 3/8 inches in length which is ideal, anything longer than 8 inches is not needed. The blade is laminated VG-10 stainless modified spear point blade. The weight of this survival knife is perfect, it feels weighty and solid but not cumbersome. The heft is balanced to precision. The Fallkniven A1 survival knife also features a black checkered Kraton handle that makes for a firm grip, even in the wet. Many divers use this knife as a diving blade which only amplifies its durability and functionality. A moderately priced survival knife that was designed and tested extensively in extreme conditions to be durable and to provide many years of utility when cared for properly. The SRK is a full tang, fixed blade knife which features a strong 6 inch blade that is tempered from AUS 8A stainless steel and is Teflon coated for added protection against the elements. The SRK survival knife is renowned for its ruggedly tough clip point which can be utilized for fine, detailed work and also enough guts for the usual slashing, cutting and even skinning work when needed. 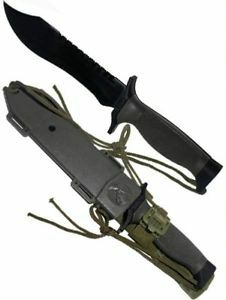 This survival and rescue knife is often commented on the edge and point configuration of 3/16 of an inch thick which falls within the parameters for skinning and gutting beasts. The handle features a tough grip of checkered Kraton for good handling even in wet and muddy conditions, a single quillon finger guard is an added safety feature. The Ka-Bar is an unashamed classic and standard issue for many elite military units around the world, the Ka-Bar BK2 companion fixed blade, full tang survival knife is a well priced versatile, ergonomic knife that should provide you with many years of faithful service if you maintain it with care. The blade measures a handy 5.5 inchers and the full length of the knife is 10.5 inches long, just the perfect length for a quality multi purpose knife. The Ka-Bar BK2 companion knife has a fixed blade which is needed for added strength, it features drop point shaping and has a 20 degree edge angle. 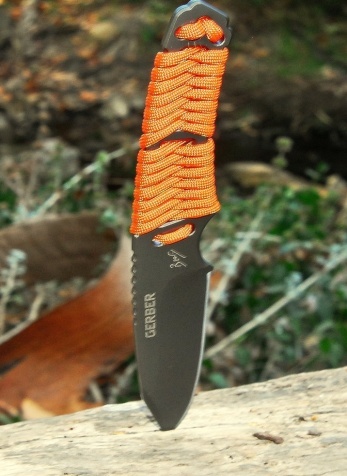 This survival knife is lighter than the other two and is a popular choice amongst hunters and serious outdoor types. It features a durably rugged 1095 cro-van steel blade and its utility is second to none and will split down kindling, cut through any material and is always ready to skin and bone out your freshly caught game. So there you have the reviews of 3 quality, durable and rugged survival knives that would be the perfect survival companion for any serious outdoors man. The only real difference between the 3 blades is price. For more info on survival knifes, read our other guides on the top military knives or the survival bowie knife?